The Signature Shop has moved! Formally the Warwick Davis Signature Shop on this very website, The Signature Shop Ltd. has expanded to provide fans and collectors authentic autographs and unique collectables at an affordable price. The new site, coming soon, will offer a better shopping experience with card payments by the world leading secure payment specialists WorldPay. For your convenience we also accept PayPal. 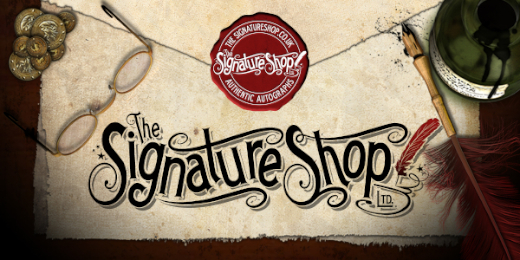 The Signature Shop Ltd. will sell autographed items by many artists, not just items signed by me. You can shop with confidence knowing all of the autographs sold on our site are genuine, because I know each of the actors personally. All of the autographs we sell are obtained at private signings exclusively for The Signature Shop and never through third parties. We are very proud to be the only company in the world to hold a license with Warner Bros. to sell signed Harry Potter photographs. You'll be able to pre-order personalised autographed photos before each exclusive signing with a Harry Potter actor, or simply order a non-personlised photo once they are in stock. Please note the actors will only sign a limited amount of photographs at each signing. Every item sold by The Signature Shop comes autographed. Each item will also come with a uniquely numbered Signature Shop hologram sticker and certificate of authenticity hand signed by myself. We hope you enjoy the shopping experience at The Signature Shop and find that unique item for your collection or a special gift for a lucky loved one. Be sure to check back often for news on upcoming signings and to see the new products we'll be adding on a regular basis.